UNLIKE HIS MYTHOLOGICAL NAMESAKE, LOS ANGELES ELECTRONIC MUSICIAN DAEDELUS KNOWS THAT WAX IS A MATERIAL BEST SUITED TO PRESSING VINYL. 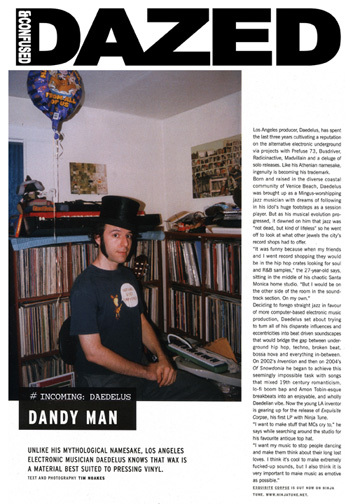 Los Angeles producer, Daedelus, has spent the last three years cultivating a reputation on the alternative electronic underground via projects with Prefuse 73, Busdriver, Radioinactive, Madvillain and a deluge of solo releases. Like his Athenian namesake, ingenuity is becoming his trademark. Born and raised in the diverse coastal community of Venice Beach, Daedelus was brought up as a Mingus-worshipping jazz musician with dreams of following in his idol's huge footsteps as a session player. But as his musical evolution progressed, it dawned on him that jazz was "not dead, but kind of lifeless" so he went off to look at what other jewels the city's record shops had to offer. "It was funny because when my friends and I went record shopping they would be in the hip hop crates looking for soul and R&B samples," the 27-year-old says, sitting in the middle of his chaotic Santa Monica home studio. "But I would be on the other side of the room in the soundtrack section. On my own." Deciding to forego straight jazz in favor of more computer-based electronic music production, Daedelus set about trying to turn all of his disparate influences and eccentricities into beat driven soundscapes that would bridge the gap between underground hip hop, techno, broken beat, bossa nova and everything in-between. On 2002's 'Invention' and then on 2004's 'Of Snowdonia' he began to achieve this seemingly impossible task with songs that mixed 19th century romanticism, lo-fi boom bap and Amon Tobin-esque breakbeats into an enjoyable, and wholly Daedelian vibe. Now the young La inventor is gearing up for the release of Exquisite Corpse', his first LP with Ninja Tune. "I want to make stuff that MCs cry to," he says while searching around the studio for his favorite antique top hat. "I want my music to stop people dancing and make them think about their long lost loves. I think it's cool to make extremely fucked-up sounds, but I also think it is very important to make music as emotive as possible."